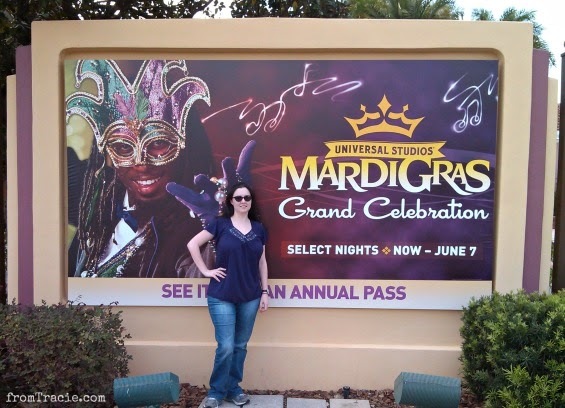 My family was invited, along with other blogger families, to visit Universal Orlando last weekend for the Mardi Gras Grand Celebration. When we arrived at the park, we were greeted by two very excited Mardi Gras characters to get us in the partying mood. Aren't their costumes incredible? I love the feathers on her mask. 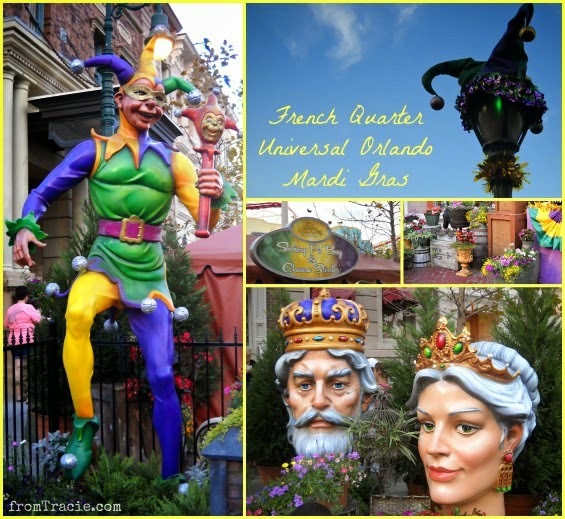 For the Mardi Gras celebration, Universal Orlando has recreated the French Quarter, to give guests a real New Orleans feel. The French Quarter Courtyard is beautiful. There are flowers everywhere, and great New Orleans inspired decorations. Each afternoon they have a different New Orleans Jazz, Blues, or Zydeco band preform, which you definitely don't want to miss. 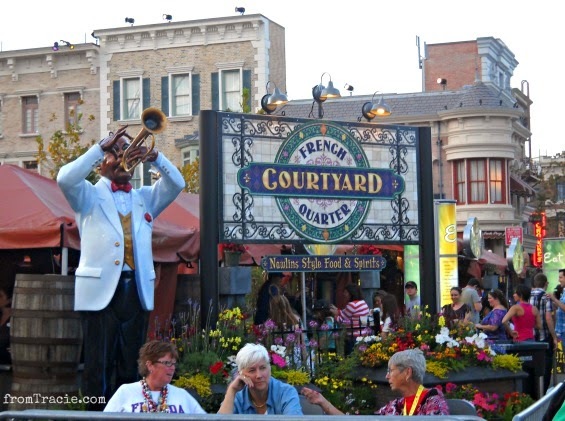 It felt a lot like being in the real French Quarter with the performers and booths with food and drinks available for purchase. I even saw a henna tattoo artist at one of the booths. I know you can't read words like "French Quarter, New Orleans, and Mardi Gras" without thinking about food, and you are wondering exactly what food is available in those booths. Cajun food, and it is delicious. The amazing smells from the food booths hit you as soon as you walk into the courtyard. We tried the Creole Gumbo (this was Katarina's favorite), Jambalaya (this was Thomas' favorite), and Andouille Sausage. I could have eaten more. They had amazing-looking Muffalettas, and I saw Thomas eyeing some Shrimp Po' Boys. 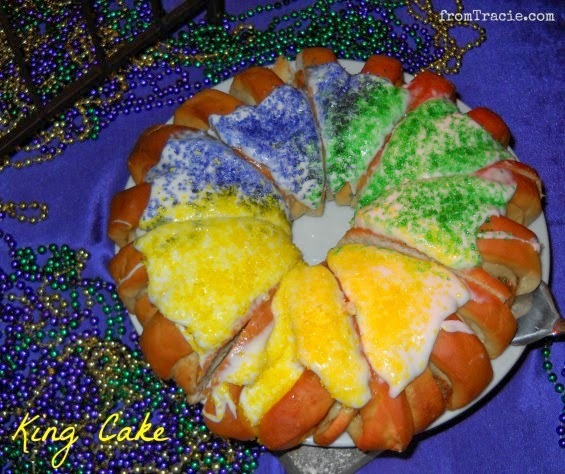 But we had to save room for dessert, because Mardi Gras wouldn't be complete without at least one slice of King Cake. I had two. My very favorite New Orleans dessert is, and always will be, Beignets. All of my childhood trips to New Orleans included at least one visit to Café du Monde. I was excited to see Universal Orlando didn't forget the most important French Quarter treat. I'm sorry to tell you I didn't get a picture of all the Beignets I ate yesterday, mostly because I was too busy eating them, and didn't take a break to pull out my camera. They were SO very good. You will just have to take my word that they looked beautiful and very powdered sugary. 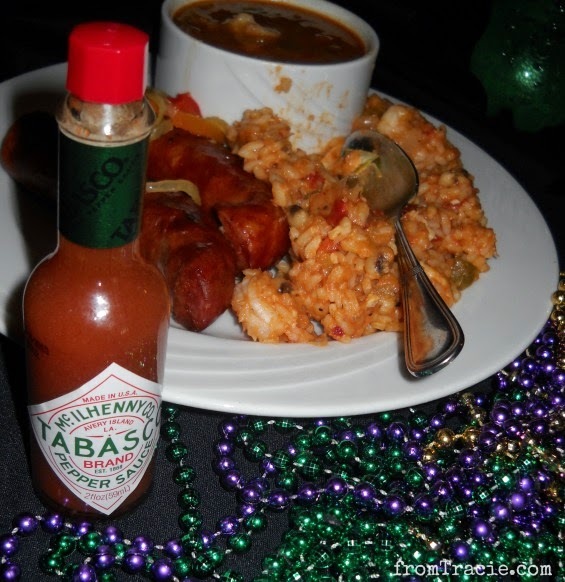 Once you take care of the food, Mardi Gras is all about the parade. 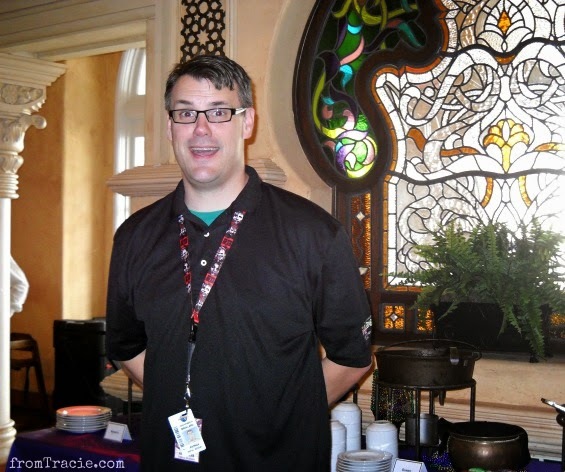 Universal Orlando has been celebrating Mardi Gras for the last 19 years. To keep it exciting and new, they rotate show directors each year. We got the chance to interview this year's Creative Development and Show Director, Patrick Braillard. He was in charge of developing the theme of the parade and helping to design new floats. One of the new floats for 2014 is actually an update of their classic Jester Float. It is the first float of the parade this year, and they wanted it to set the tone with colors, fun, and glitter. Glitter is a huge part of the float decorating each year. They actually order hundreds of pounds of glitter that arrives packaged in five gallon buckets. 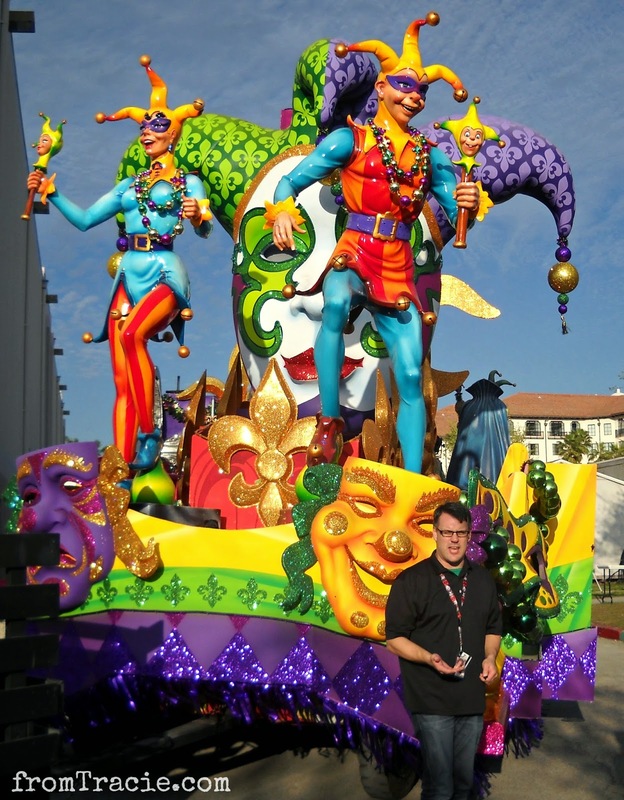 The team in charge of the Mardi Gras parade turns to master float makers when it is time to bring their ideas to life. 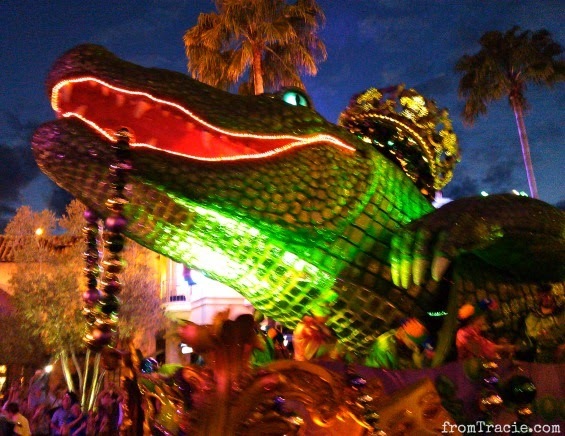 Each of Universal's Mardi Gras floats are built by Blaine-Kern Studios, the same group who has been building the floats for the parades in New Orleans since 1947. You can see the craftsmanship that goes into every detail on these floats. 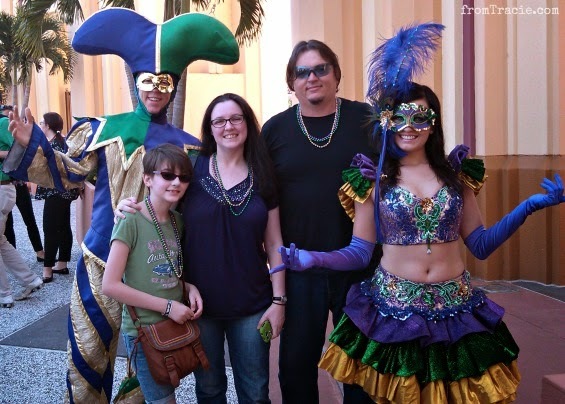 The most important thing about Universal Orlando's Mardi Gras Celebration is that the entire thing is family-friendly. I grew up in Pensacola, less than an hour away from Mobile, Al, and a few hours away from New Orleans, so Mardi Gras celebrations feel a little bit like home for me. 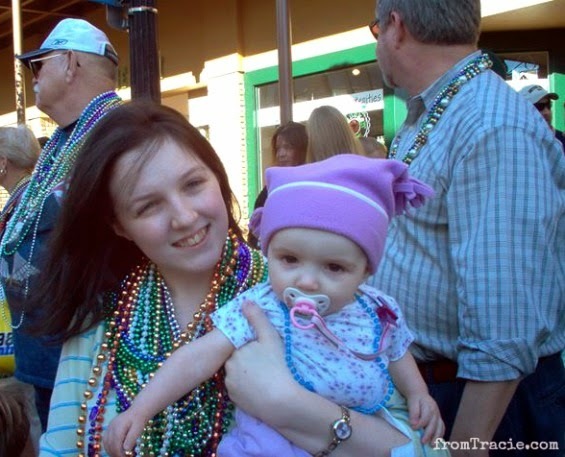 We took Katarina to her first parade when she was less than a year old, but I know it can be hard to find parades that are family-friendly. It is really nice to attend a Mardi Gras event that is fun for everyone. She didn't catch a lot of beads that day, but she had a super cute hat. Katarina made my beads extra awesome by making a star. During each Mardi Gras parade at Universal Orlando, over 160,000 strands of beads are tossed out to the crowd. That is a lot of beads. They also pass out gold doubloons to commemorate the event's theme. So you are sure to go home with a great haul. 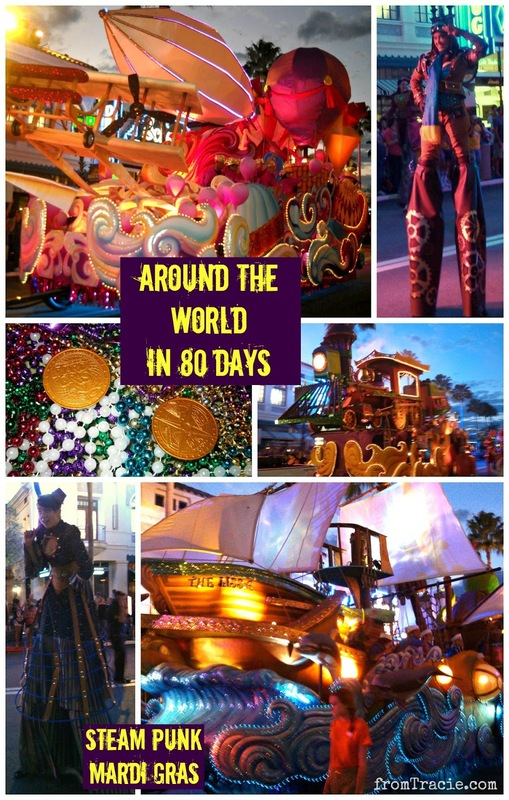 Three new floats were created especially for this year's theme - Around The World In Eighty Days - based on Jules Verne’s classic book. They highlight travel by sea, air, and land. The boat on the sea-themed float is named The Lissa, after Patrick Braillard's wife, which is really sweet. One of the most impressive parts of any parade at Universal is the stilt walkers. They are very talented. I would fall flat on my face if I tried to do that (I've fallen flat on my face without stilts, so I know better than to ever attempt it). My favorites in this parade were the Steampunk stilt walkers. Their costumes were amazing, and a perfect companion to the Around The World In Eighty Days theme. Mixed in with this year's themed floats were the classic Mardi Gras floats. 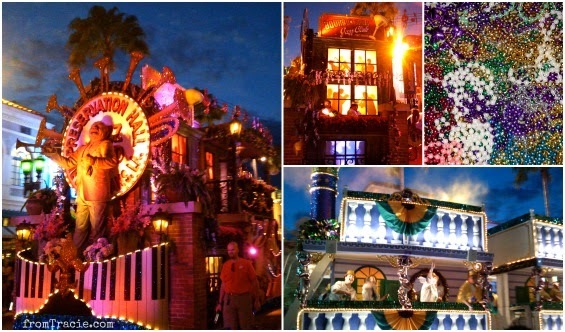 I loved these floats inspired by New Orleans. The details of the jazz musicians and dancers were awesome. And they didn't skimp on the glitter, either. Just in case the glitter and beads aren't enough, the floats also shoot confetti out into the air. There are twelve floats in all, with stilt walkers, and dancers in between. The parade concludes with the King and Queen float. Each night the king and queen are selected from the group of annual passholders who are signed up to toss beads. The fun doesn't end with the parade. Each evening of the Mardi Gras Grand Celebration, there is a different concert at the Universal Music Plaza. 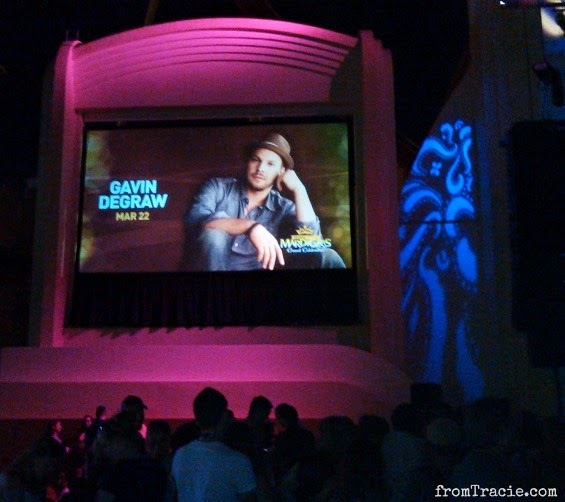 The night we attended, the musical guest was Gavin DeGraw. Gavin was awesome, and it was the perfect end to the evening. 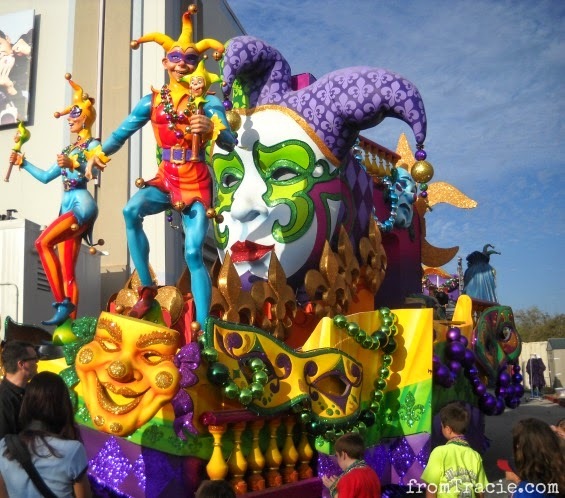 You still have time to celebrate Mardi Gras at Universal Orlando. It will continue on select nights through June 7, 2014. If you are going to spend the whole day at Universal Orlando, admission to the Mardi Gras Celebration is included in your ticket. You can also buy special "After 5" tickets if you want to eat some great food, attend the parade, and see a concert, but don't want to spend the entire day visiting the park. 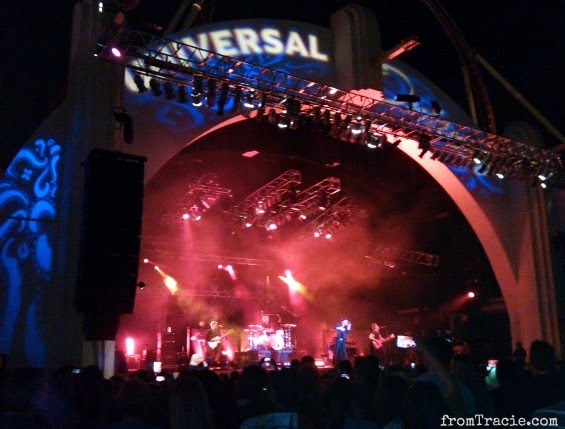 The concert schedule and other information is available on the Universal Orlando website. *I was given media tickets to attend this event with my family, and was not compensated in any other way. I was not required to say nice things in this blog post, eat my weight in beignets, or double my weight with beads. Those choices were all mine, and they were good. That looks like it was so much fun. I haven't been to Universal in about 10 years and I think I am way overdue! Definitely overdue. There are so many new and exciting things you haven't gotten to see/do/ride. Your whole family would have a blast. Looks like a ton of fun! Plus the food looks awesome! The food was so SO good. Looks like you all had a great time! Love your pictures too...those floats were amazing! They really are. It was neat to visit them up close before the parade, and really be able to see all the details. It was a fabulous day! Looks like you had a blast. That food looks amazing! looks like TONS of fun!! maybe we should plan our visit near mardi gras! Yes!! I'm glad they extended the dates this year so you have time to make it down here. 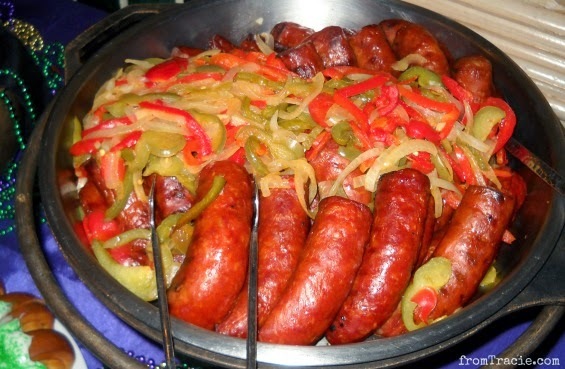 Mardi Gras is so much fun and of course the food is usually pretty fantastic too! I love looking at all your pics! I'm quite jealous now and wish we had something like this around here. So amazing to see Katarina as a baby! And I miss Universal SO much. We spent two days there, as opposed to only one in Disney and one in SeaWorld. When I was 20 or so I flew to New Orleans with my then-boyfriend as a birthday gift. We arrived at the crack of dawn and went to Café du Monde. Ah. I miss the chicory root coffee too. I'm so glad you liked the baby Katarina picture. I just couldn't resist sneaking it in there. I didn't blog when she was a baby, so I never got to share those fun pictures. Café du Monde. I have dreams about beignets and chicory root coffee. New Orleans is a great birthday trip. I think you just have to come back and visit again! :) You can never have too much Universal in your life. And the new Harry Potter world is opening this summer. That looks like SO MUCH FUN! I grew up in SE texas and I miss Mardi Gras celebrations! I think a nice warm Florida one would be prefect! What a great way to celebrate Mardi Gras! I LOVE beignets, too, and would love to have seen Gavin DeGraw! Gavin DeGraw was so awesome!! I was happily surprised to recognize some of his songs that I didn't know were his. This is definitely the way to do Mardi Gras. Wow! That looks like so much fun! Makes me wish we lived near Orlando. I have never been to the real Mardi Gras but this looks almost as fun. I hope to visit both someday! Oh wow, how cool! This looks like an amazing time to go visit! Can't wait till my parents retire out there.. I'll have even more reasons to visit! That is so cool and family friendly!!! This is really so much fun! We have visited here and it's worth the trip! This looks like it was a fun experience. I love Mardi Gras! This looks like a fun time! Universal Studio is doing a great job making Mardi Gras special. Wow! Such wonderful memories to be making with your family! I have never been to Orlando but it looks like a blast! Looks like you guys had a great time with the family. I love that Universal is making this holiday more family friendly than most celebrations! Looks like a great time was had by all!! I live in Florida so may have to check this out next year!!! We went to this last year, definitely fun times! sounds like a great time, I haven't been to Universal Studios in years, love the Superhero section! I want to be a blogger in Florida! Looks like tons of fun. I love your disclaimer...especially the beignets. What a great way to celebrate Mardi Gras! It looks like you had a blast. Oh wow, they really go all out. It really does have a NOLA feel too it. I would be right there with you noshing on the beignets. Cool. Fun doesn't have to be about drinking and craziness. That looks like so much fun! Ahhh beingets. Now I want to go to NOLA and get me some! Fun! I love that picture of your daughter as a baby. She has that same deep thinking look in her eyes I see in so many of the pictures you share of her now. Wow, how awesome! I'm hungry for some jambalaya now though! 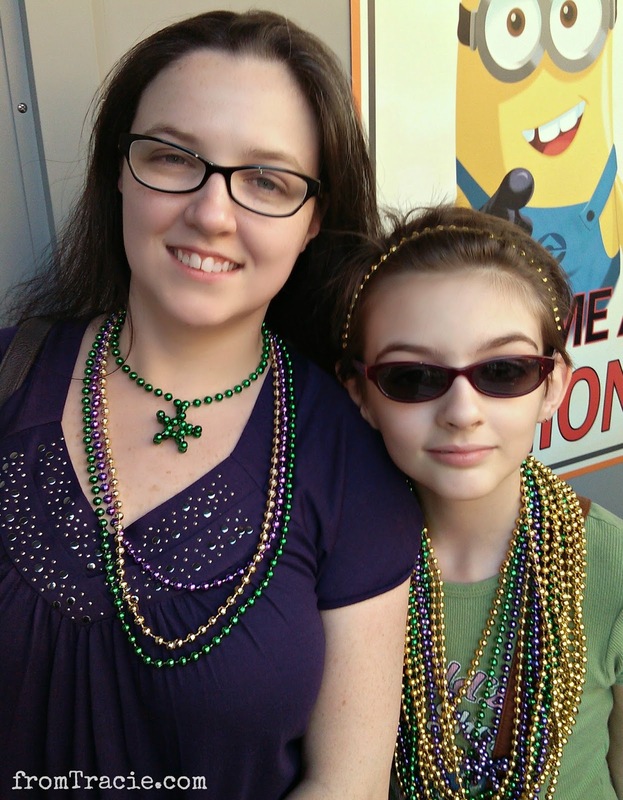 This definitely looks like it was a great, family friendly mardi gras celebration! All of that food looks like it was delicious! This looks like such a blast! I'm loving the costumes and the food looks amazing! I LOVE New Orleans but I'm not sure I'll ever go during Mardi Gras because it's a little wild. This is the perfect solution to that, and those floats are gorgeous! So very jealous!! I've always dreamed of going to Cafe du Monde and having beignets! Now I know I can come visit you and we can go to Universal and have all the best parts of Mardi Gras! Woohoo! Love the pictures! Looks like it was a fun event. I wish we lived close to places like this.